Comments on: "William Shakespeare Quotes: I would be loath to cast away my speech, for besides that it..."
Great men may jest with saints; ’tis wit in them, But in the less, foul profanation. A right judgment draws us a profit from all things we see. Shakespeare was born and brought up in Stratford-upon-Avon. At the age of 18, he married Anne Hathaway, with whom he had three children: Susanna, and twins Hamnet and Judith.Between 1585 and 1592, he began a successful career in London as an actor, writer, and part owner of a playing company called the Lord Chamberlain's Men, later known as the King's Men. 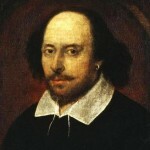 Shakespeare was a respected poet and playwright in his own day, but his reputation did not rise to its present heights until the 19th century. The Romantics, in particular, acclaimed Shakespeare's genius, and the Victorians worshipped Shakespeare with a reverence that George Bernard Shaw called "bardolatry". In the 20th century, his work was repeatedly adopted and rediscovered by new movements in scholarship and performance. He appears to have retired to Stratford around 1613 at age 49, where he died three years later.Shakespeare died on 23 April 1616.